We’ll be marching down in New York City this Saturday! 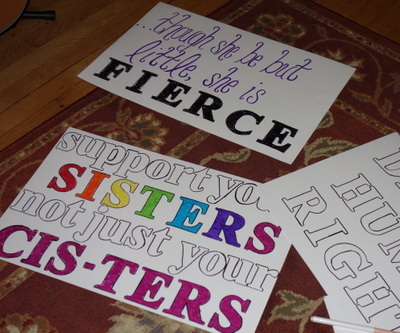 Shortly after the election the girls and I went to something-or-other billed as a demonstration, and we made signs and were all revved up, and then it was just. . . sad. It was like an extra-sad funeral service for old former hippies. We wanted to march! We wanted to chant! Then, when the DC women’s march started making news, I was torn. It’s a schlep, for sure. I also didn’t love the idea of gathering the day after the inauguration in Washington, where there are still likely to be Trump supporters. It seemed a little too confrontational a situation to bring the kids. At the same time, the prospect of sitting at home would feel like we were passively sitting by and missing history. We could go to downtown Albany, maybe, but how many people would actually show up there? So when I heard about a bus trip down to NYC, it seemed like the Goldilocks solution for us. Especially since the bus is leaving from around the corner from our house. I signed us up and hoped that a few friends might be on the bus, too. Sure enough, there are friends and other friendly-but-not-our-friends-yet people. I am super-excited, actually. I think it will be a terrific experience for the girls, and Cute W and I both know New York enough to feel comfortable there. Sure, right now the forecast calls for rain, but I still think it will be a great time. Now we’re trying to come up with signs. Personally, I like double-sided signs, because, frankly, there are so many things to protest about, and that doubles your message. After careful consideration, both girls want to go with “I stand with Planned Parenthood” for one side. They checked out a bunch of other ideas, and M seized on, “Stand with your sisters, not just your cis-ters.” She’s pro-pun. Then I had to ask if she even understood what “cisgender” meant, and she and J both looked at me like I was asking if they knew that cows moo. You guys, these kiddos are way, way, way beyond us. And by “these kiddos,” I don’t just mean my kids, but kids in general. I’ve noticed this among their classmates and neighborhood kids in the past as well. Ready or not, the gender binary is sinking into oblivion. Anyway, for those of you who are feeling flustered and out-of-whack by the 14-year-old’s forward-thinking, J decided to go a more traditional route, quoting William Shakespeare from A Midsummer’s Night Dream: “. . . though she be but little, she is fierce.” I thought it would be fun since she’ll be one of the shorter marchers, plus, let’s face it, she is totally fierce. I am not entirely decided at this point. I’ve started on a “Defend Human Rights,” but I’m not wedded to it yet. But I’ve got to get moving on these signs and get to the rest of my list (find those portable rain slickers that are packed away somewhere, figure out our if-we-get-separated-and-the-cell-towers-are-overloaded plan, ponder bus-snack options, gather up festive headware, . . . .). So I’d better get crackin’! Oh I am so jealous! We are with you in spirit. Be safe! Be fierce!